Steelcase 9000 Enhanced Workstation-Cubicles. 65″ dropping on the wings to 53″ / 70 Available / Boston, Mass. These Steelcase 9000 Enhanced cubicles measure 90″ x 81″, the panels are 65″ tall winging down to 53″. The workstations must be sold in pods to accommodate their 8 wire baseline and beltline power. 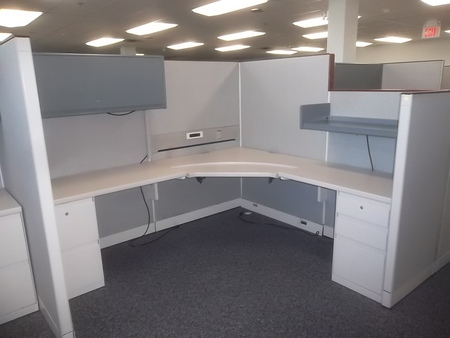 Each workstation includes a 45″ x 45″ corner worksurface with adjustable height, 24″ x 45″ wing worksurface, 24″ x 36″ wing worksurface, 24″ B/B/F pedestal, 24″ F/F pedestal, 45″ overhead bin, and a 36″ half height shelf. The laminate finish code is 2722, Steelcase Cream. The paint is Steelcase finish code 4762 and 4763, Steelcase Cream and Graphite. The fabric on the cubicles is Steelcase finish code N002, Milano Delft. The top caps are wood.